Choosing the right diaper bag for cloth diapers is sometimes hard because of all the bags on the market. The best bags will have lots of pockets for storing diapers, creams and other baby supplies. You'll want a bag that is easy to carry and won't weigh you down too. What is the Best Type of Diaper Bag? Though many diaper bags have a highly feminine look, this Bag Nation backpack bag has a rugged and masculine design that would look at home on the arm of a soldier. Designed for carrying on your bag, it comes with a strap for hanging it from your stroller or another device. Made from a type of polyester that the manufacturer specially treats, this bag is resistant to water damage and comes with pockets that will keep the liquids and odors on cloth diapers from coming through. An included sundry bag gives you storage for the things you want to carry for yourself and a changing pad matches the design of the bag. Designed for both men and women, this CoolBell diaper bag has three insulated pockets inside for storing formula and milk at a cool temperature, but those pockets can also keep snacks chilled as your child ages. Adjustable straps on the top can accommodate a number of different users and allow you to change the way the bag fits to increase your comfort. Made from nylon, the outside of the bag is easy to clean and is rugged enough to withstand frequent camping trips or outdoor adventures with your baby. It also comes with two straps for attaching the bag to a stroller and a matching changing pad that fits inside. Hip parents and those tired of the old-fashioned looking diaper bags on the market might prefer this striped bag from Hip Club. Designed to look like the type of tote bag that you might carry to the beach, it features alternating stripes in black and white across the sides and shorter handles on top. 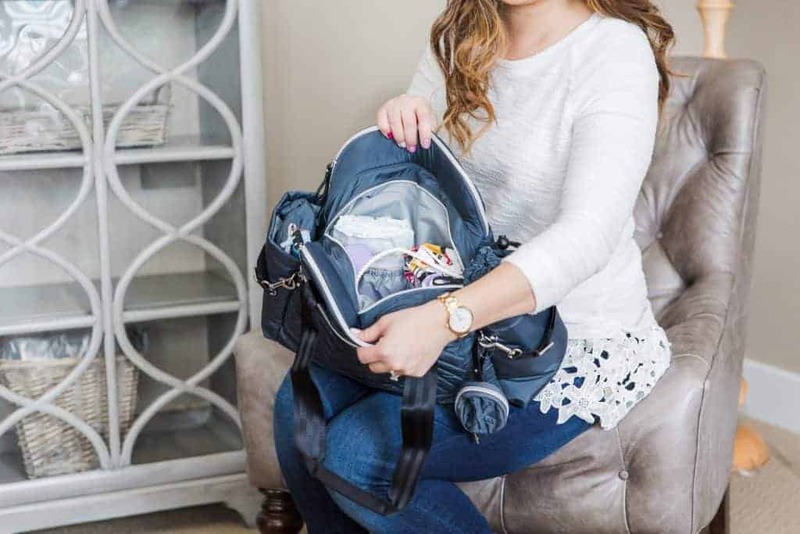 An attached clip lets you hang the diaper bag from your stroller when running errands, and it comes with a matching changing pad that hooks to the bag. A zipper on the top of the bag keeps the inside closed. The bag also has side pockets and interior pockets as well as a pocket for storing wet cloth diapers while away from home. Designed for busy parents who want to feel stylish when toting around a child, this diaper bag has backpack straps for wearing it on your back and keeping your hands free. Straps on the front of the bag also let you carry it like a purse or tote. Capable of meeting the demands of any busy lifestyle, this bag has reinforced stitching on the sides that won't fray and an exterior made from durable nylon with a coating that is resistant to water on top. That coating stops liquids inside the bag from leaking out. It also has storage for cloth diapers and smaller pockets for pins. This Skip Hop bag, which comes in a fun chevron print, has two handles for grabbing the bag and going as well as an adjustable shoulder strap. That strap has a padding piece to reduce fatigue on your back and shoulders too. It features a total of 10 different pockets, including smaller interior pockets for pins and larger pockets on the outside for cloth diapers. Included clips and straps help you attach the bag to your stroller or a table to keep it nearby without wearing it all day long. The bag has a few zippered compartments that will keep other kids and adults from rummaging through it. Cloth diapers are generally thinner than other diapers. When you look for a bag though, you need to make sure that it offers enough storage for the liners that you use with those diapers. These liners keep the liquid and solid waste from soaking through the diapers. There are some other things you should look at when shopping for and comparing diaper bags. Standard diaper bags look like large messenger bags and have a long strap that you can toss over your shoulder. Some companies now make diaper bags that look more like a backpack and will fit over one or both shoulders. A backpack diaper bag is best for those who want to keep their arms free and carry a baby. Busy parents may appreciate pockets on the outside of the bag because they can find what they need without digging through the bag first. Those pockets help you store liners and anything else you might need. Top bags will have at least four pockets on the inside and at least two in the center or inside. The material used on the outside of the bag will give you an idea of how quickly you can clean that bag. Though some parents prefer cloth, you may find that nylon or another rugged material will last longer. A good bag is one you can toss in the washer for cleaning too. You may want to look for a bag in a color or pattern that matches your stroller or nursery also. Some optional or extra features found on diaper bags include a matching changing pad that attaches to a strap inside the bag or specialized holders for storing bottles. Some bags have adjustable straps that let multiple users carry the same bag. While there are a lot of diaper bags that will work with cloth diapers, the choice for the best bag is pretty obvious. The Bag Nation Diaper Bag Backpack looks like a large backpack and has insulated pockets that keep food and drinks at the perfect temperature for your baby. Multiple zippered pockets on the outside are just the right size for your child's toys and accessories, but you'll find lots of extra storage space inside too. Thanks to its adjustable straps, anyone who spends time with your child can use this bag.